Surgical repair of Congenital Diaphragmatic Hernia (CDH) is one of the major neonatal emergencies that pose many challenges to the treating neonatologist, intensivist, pediatric anesthesiologist and the surgeon. Mostly these babies are premature having physiological immaturity of various organ systems and in association they may be having lung pathologies or other major congenital defects. Smooth induction/maintenance, adequate intra/post-operative analgesia and uneventful post-operative recovery are the major objectives to be achieved with the anesthetic plan. The use of Regional Anesthesia (RA) has found to be very safe and effective when combined with General Anesthesia (GA). We report a case of two days old baby for surgical repair of CDH that was managed successfully with GA along with epidural analgesia .The baby was induced and intubated under O2 + sevoflurane anesthesia and maintained with muscle relaxant atracurium. Epidural catheter was passed up to T6 through caudal route to facilitate intra and post-operative analgesia with ropivacaine. There was excellent hemodynamic stability, satisfactory perioperative pain relief and uneventful recovery. The incidence of Congenital Diaphragmatic Hernia (CDH) is 1:2500 and it is one of the critical neonatal emergencies that need correction immediately after birth. The anesthetic considerations in neonates are extreme prematurity of the various organ systems, association of other major cardio-respiratory anomalies that complicates the anesthetic and perioperative management. Associated pulmonary hypoplasia/collapse of contralateral lung due to herniated stomach/bowels/liver causing mediastinal shift resulting in reduced uptake of oxygen and extent of pulmonary hypertension needs to be considered. Many recent studies report the success of combination therapies of HFOV, inhaled nitric oxide, low ventilator pressures, permissive hypercapnea, surfactant replacement, ECMO and delayed surgery after stabilization. A multidisciplinary approach by neonatologists, intensivist and anaesthesiologist is necessary. The main goals are vigilant perioperative monitoring; smooth induction, maintenance with gentle ventilation, good postoperative analgesia and uneventful recovery. Over the year’s advancement in neonatal anesthetic techniques have resulted in improved outcome and decrease in the morbidity/mortality after neonatal surgical emergencies [1,2]. Use of combined general anaesthesia and caudal epidural analgesia has been reported in literature for specific advantages like minimal requirement of intra-operative anaesthetic/analgesic supplements as well as lesser need of postoperative ventilation therapy with good postoperative analgesia. We aim to present our experience with the combined technique of anaesthesia for repair of diaphragmatic hernia in a two days old neonate. An averagely built 26 years female, primigravida, underwent lower segment caesarean section for breech presentation, delivered full term (37 week) female baby. Mother had regular antenatal check-up. There was no history of any major illness in the past or during pregnancy and not associated with poly-hydromnios or pregency induced hypertension. There was no evidence of congenital anomalies in her or husband’s family. Her prenatal sonography was suggestive of left diaphragmatic hernia in the fetus. The child presented with asymmetry of chest wall, tachypnea after birth, admitted to NICU for further management. Since birth she was kept nil by mouth on parenteral maintenance fluid and nasogastric tube was passed. The baby was kept in semi-sitting position in neonatal intensive care unit with oxygen supplementation. Following radiological and blood investigations she was posted for surgical repair at 48 hours. No other congenital anomaly was associated. 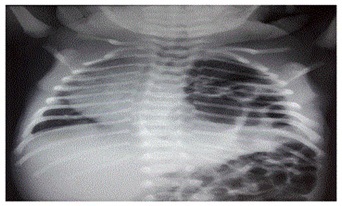 At birth Echo was normal, X-ray chest revealed collapse of left lung and the heart/mediastinum was shifted to right side with bowel shadows seen in left part of chest (Figure 1). Her Hb was 17 gm/dl, total leukocyte count of 17,200, platelets of 3,75,000. Liver/renal function test, INR, bleeding/clotting times and serum electrolytes were in normal range. General examination revealed weight: 2.56 kg, head circumference: 31 cm, Heart Rate (HR): 144/min, Respiratory Rate (RR): 52/min with decreased chest movements on left side. On auscultation heart sounds heard in the right parasternal region with markedly decreased air entry on left side and bowel sounds heard in the left side of chest. Abdomen was scaphoid. Preoperative ABG was in normal range. On air oxygen saturation was 95%. The urgency of surgery with high risk of anesthesia and need of postoperative ventilator/intensive care was explained to the parents and high risk consent obtained. One packed cell volume of blood was kept reserved. Anaesthetic management: General Anaesthesia (GA) with Caudal Epidural Analgesia (CEA) was planned. Monitoring started for HR, ECG, NIBP and baseline readings were noted. A peripheral IV line with 24G cannula was taken and infusion of ringer lactate 8-10 ml/kg started. Baby was pre-medicated with Inj. Ondansetron 0.3 mg IV, Inj. ranitidine 1.75 mg IV, Inj. glycopyrrolate 0.012 mg IV, pre-oxygenated with 100% O2 for 5 minutes; induced with 10 mg of propofol IV along with incremental sevoflurane up to 2%. After achieving adequate depth of anaesthesia intubated with 3.0 No: uncuffed endotracheal tubes, air entry checked bilaterally and tube was fixed. Anaesthesia maintained with 100% O2 in sevoflurane and Inj. atracurium 1 mg IV as muscle relaxant. In lateral position under aseptic precautions with 19G Tuohy’s needle, epidural catheter was placed through caudal route for 10 cm inside to reach at T6 Level (distance measured from caudal to mid thoracic level of T6). Ropivacaine 0.2%, 3 ml was injected through the catheter to supplement analgesia (Figure 2). Intra-operatively additional monitoring of EtCO2, neuromuscular function (TOF Watch Organon Teknika), temperature, urine output and blood loss was done. Throughout the intra-operative period HR was in the range of 100-130/min, mean blood pressure was 50 to 60 mm of Hg, SPO2 was maintained in the range of 97-100% and EtCO2 up to 35 mm of Hg. Surgery was performed through left sub-costal incision to reposition the bowels from the chest into abdomen with the closure of large foramen in diaphragm. 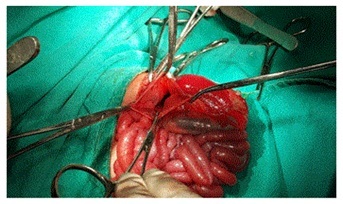 The contents of hernia sac were spleen, stomach and colon (Figure 3). The intra-operative blood loss was around 35 ml and surgery lasted for one hour. Total intravenous fluid given over one half hour was 80 ml (60 ml ringers lactate + 20 ml of 0.45% of dextrose with saline). Intercostal Drain (ICD) was put on left side at the end of the surgery. After completion of surgery inhalational agent stopped; suctioning done, recovery of TOF to 0.6 noted and the neuromuscular block was reversed with neostigmine 0.05 mg/kg and glycopyrrolate 0.008 mg/kg. Baby was awake with 98% saturation on air with bilateral air enter on auscultation. There was full recovery of consciousness/power with stable vitals (heart rate of 120, RR of 38/min, temperature 360C, urine output of 7 ml), so extubated on table and later shifted to NICU in the warmer with O2 by hood at 4L/min, IV maintenance with isolyte P. Inj. collistin (20000 IU/kg/dose), Inj. meropenam (40 mg/kg/dose) was given. Vitals and ABG monitoring continued. Epidural top ups were given 12 hourly with 3 ml of 0.2% ropivacaine for 48 hours and the catheter was removed. X-ray chest was done to confirm bilateral lung expansion and absence of bowel shadows in the chest and the ICD was removed on fifth post-operative day (Figure 4). Patient was stable with soft abdomen, return of bowel sounds and oral feeding started. She was discharged on 10th postoperative day after full recovery. Diaphragmatic hernia is a congenital developmental anomaly that occurs due to failure of diaphragm to fuse properly during foetal development resulting in migration of abdominal contents into the chest. It is usually associated with hypoplasia of lungs and frequently cardiac abnormalities. In 90% cases the defect is posterolaterally i.e., through foramen of Bochdalek’s and 80% are left sided. Severity varies with the degree of pulmonary hypoplasia and hypertension . Immediately after birth orogastric tube for continuous suction to prevent bowel distention and further lung compression is necessary. Medical therapy directed toward optimization of oxygenation by immediate intubation, avoiding mask ventilation and high inspiratory pressures to prevent barotrauma. Due to surfactant deficiency and lung hypoplasia some babies may require ECMO to maintain oxygenation. 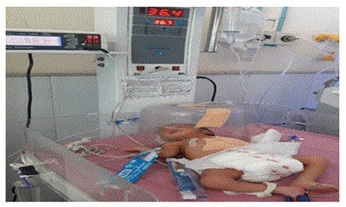 These babies are critically ill and need meticulous monitoring of oxygenation, ventilation and perfusion . The neonates with CDH needs emergency surgical correction and thus associated with lot of challenges and difficulties with anaesthetic management. A team work by neonatologist, anaesthesiologist and the surgeon is needed for early recognition, prompt life saving measures and surgical management to achieve best outcome [2,4]. Over the years lot of advancement has taken place in the care of these neonates with increased knowledge about embryological development, antenatal diagnosis by ultrasound/MRI, pathophysiology of the condition and perioperative management resulted in better survival rates of > 80% [3-5]. Some of the antenatal predictors mentioned are detection of an intra-thoracic liver, Lung to Head circumference Ratio (LHR), size of diaphragmatic defect, Lung to transverse thorax ratio, assessment of lung volumes and cardiac axis [5-9]. Prenatal ultrasonography and measurement of maternal alpha-fetoprotein which is low in infants of CDH as well as trisomy 18 and 21. There is reduction in surfactant apoprotien-A of alveolar type II cells. Several studies support delayed surgery after stabilization with high frequency oscillatory ventilation, surfactant replacement and EHCMO there by improves oxygenation, lung expansion and reduces risk of pulmonary hypertension. Inhalation of nitric oxide in clinical trials of infants with hypoxic respiratory failure has shown to improve oxygenation significantly and decreases the need for ECMO . Cartlidge et al., in his 17 patients observed decreased mortality from 88% to 47% by allowing preoperative stabilization . The anaesthetic considerations of these critically ill infants are mainly physiological immaturity of different organ systems and poor drug handling mechanisms, problems with ventilation/oxygenation and related to associated congenital disorders. Intra-arterial catheter and central venous pressure catheter are useful for monitoring in critically ill neonates. The use of Regional Anaesthesia (RA) like intercostal, intraplural infusion or epidural analgesia has been found to be very safe and effective when combined with GA. It reduces the requirement of inhalational anaesthetic agent, also allows avoidance of N2O and decreases the need for postoperative ventilator as well as reduces the chances of postoperative respiratory complications such as atelectasis, V/Q mismatch and hypoxemia. We used 100% oxygen in savoflurane as N2O increase pulmonary vascular resistance and causes distension of bowels. 100% oxygen helps to decrease pulmonary vascular resistance. Ventilation with small tidal volumes and low inflating pressures are advocated to avoid contralateral pneumothorax [2,12-14]. The post-surgical long term complications reported are of low pulmonary perfusion on the herniated side on V/P scan, gastroesophageal reflux, failure to thrive, herniation, chest asymmetry and significant scoliosis . Our patient was also stabilized for 48 hours andwe used combined technique of GA with CEA and found stable hemodynamic speri operatively. Case series reported by Aggrawal et al., about use of GA with CEA in repair of neonatal diaphragmatic hernia by video assisted thoracoscopic surgery where they also observed stable intra-operative course due to less stress responses and better pain control which is also observed by Bosenberg et al., [12-14]. We report a case of two days old baby for surgical repair of CDH that was managed successfully with GA along with epidural analgesia. There was excellent hemodynamic stability; satisfactory perioperative pain relief and uneventful recovery thus support the combined technique of anaesthesia. We thank to our DY Patil Institution for giving support in the process of submission of this case report. Liu LM, Pang LM (2001) Neonatal surgical emergencies. Anesthesiol Clin North America 19: 265-286. Pani N, Panda CK (2012) Anaesthetic consideration for neonatal surgical emergencies. Indian J Anaesth 56: 463-469. King H, Booker PD (2005) Congenital diaphragmatic hernia in the neonate. Continuing Education in Anaesthesia Critical Care & Pain 5: 171-174. Steinhorn RH (2014) Pediatric Congenital Diaphragmatic Hernia Treatment & Management. Medscape, USA. Bösenberg AT, Brown RA (2008) Management of congenital diaphragmatic hernia. Current Opinion in Anesthesiology 21: 323-331. Arkovitz MS, Russo M, Devine P, Budhorick N, Stolar CJ (2007) Foetal lung-head ratio is not related to outcome for antenatal diagnosed congenital diaphragmatic hernia. J Pediatr Surg 42: 107-111. Jani J, Peralta CF, Benachi A, Deprest J, Nicolaides KH (2007) Assessment of lung area in fetuses with congenital diaphragmatic hernia. Ultrasound Obstet Gynecol 30: 72-76. Jani JC, Cannie M, Peralta CF, Deprest JA, Nicolaides KH, et al. (2007) Lung volumes in fetuses with congenital diaphragmatic hernia: comparison of 3D US and MR imaging assessments. Radiology 244: 575-582. Kalache KD, Mkhitaryan M, Bamberg C, Roehr CC, Wauer R, et al. (2007) Isolated left-sided congenital diaphragmatic hernia: cardiac axis and displacement before fetal viability has no role in predicting postnatal outcome. Prenat Diagn 27: 322-326. Meurs KV, Short BL (1999) Congenital diaphragmatic hernia: the neonatologist’s perspective. Pediatr Rev 20: 79-87. Cartlidge PHT, Mann NP, Kapila L (1986) Preoperative stabilization in congenital diaphragmatic hernia. Archives of Disease in Childhood 61: 1226-1288. Bosenberg AT (1998) Epidural analgesia for major neonatal surgery. Paeditr Anaesth 8: 479-483. Bosenberg AT, Hadley GP, Wiersma R (1992) Oeophageal atresia: caudo-thoracic epidural anaesthesia reduces the need for postoperative ventilator support. Pediatric Surgery International 7: 289-291. Aggarwal A, Lohani R, Suresh V (2016) Case series on anesthesia for video-assisted thoracoscopic surgery for congenital diaphragmatic hernia in children. Anesth Essays Res 10: 128-131. Figure 1: Pre-operative X ray chest. 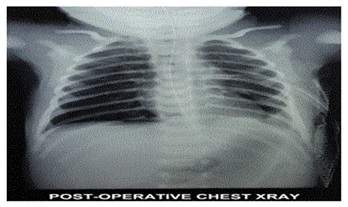 Figure 4: Post-operative X ray chest. Citation: Kulkarni K, Patil S, Mubarizuddin A, Malager A (2018) Management of Congenital Diaphragmatic Hernia with Epidural and General Anaesthesia. J Anesth Clin Care 5: 30. Copyright: © 2018 Kulkarni K, et al. This is an open-access article distributed under the terms of the Creative Commons Attribution License, which permits unrestricted use, distribution, and reproduction in any medium, provided the original author and source are credited.